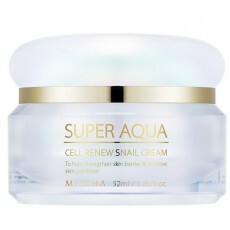 This K-Beauty Favorite from Missha features 70% Snail Mucin Extract as the star ingredient. Snail Mucin is known for its powerful properties in healing and repairing skin troubles like acne and acne scars . It also improves dark and dull skin tone due sun damage, lessens fine wrinkles, minimizes skin irritations and strengthens skin barrier for firmer and healthier skin. Together with Baobab Tree Extract, Deep Sea Water and other active herbal extracts and ingredients, this cream makes dry, dull and irritated skin glowy and well hydrated again. Absorbs fast in the skin after application due to its light gel texture, which oily skin would also love! Recommended for all skin types including sensitive and acne prone skin, as well as for mature skin that needs an extra anti-aging care. After cleansing and toner, essences or serums apply an ample amount of this cream using a spatula included in the box. Pat it gently to skin until well absorbed. Follow with your sleeping mask cream if you are using one.